Ben has passed his driving test! Yay, I’m bringing you good news, my lovely readers. 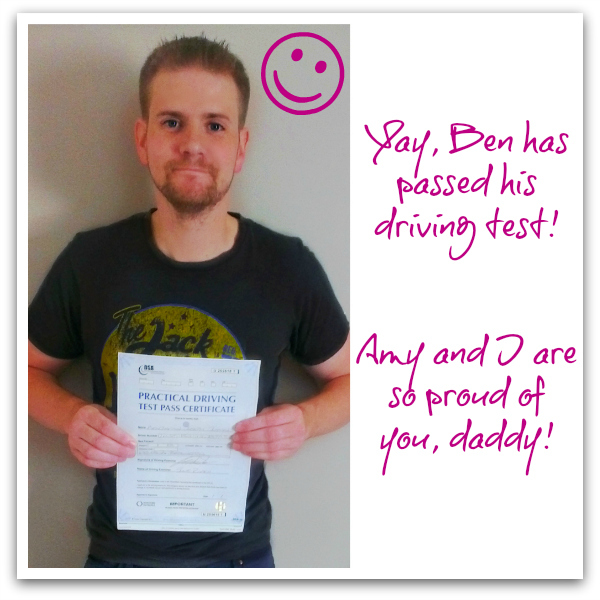 Ben went for his driving test today and passed it at his first attempt. Amy and I are so very proud of him, especially as he was so nervous when he left for his last lesson and the test this morning. I know that Ben’s a good driver, he’s been driving with his mum and dad for years and has the experience you need to manoeuvre a car along the narrow roads of Bristol, but sometimes his nerves get the better of him and that’s where everything can go terribly wrong. Luckily, he found a lovely driving instructor for an eight-lesson refresher crash course. The course came at a great price and gave Ben the confidence he needed to pass his test without any major slip-ups. So yay, at least one of us is able to drive now, which will mean a massive lifestyle change for us. That sounded very dramatic, didn’t it? But it actually means that we will be more independent and can go to places that are more than a stone throw away. Not that Bristol is not a great city to live in, but there’s so much more to discover and I can’t wait for it. It will be great for us to get out a bit more. Next one to do their licence is apparently me, so I’ll keep you informed about any developments that will see me getting four wheels under my bum. I can’t quite imagine me driving a car just yet though. I can’t even handle a bumper car without giving me and my passenger a concussion, so yes, it looks like it’s getting exciting. But how about you? When did you get your driving licence? Did you pass first time and what was your first trip as a licensed driver? yaay! well done! I passed mine a very long time ago when I was a month off my 18th birthday (1st time) & I couldn't imagine not driving now, I think I'd be lost without my wheels. My first trip out was up to the petrol station with my brother so he could tell me how to fill up!